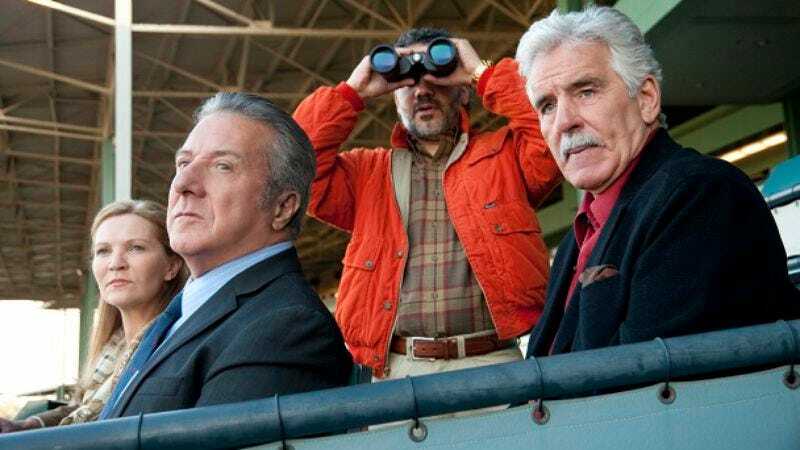 There are any number of good places to start the discussion of the fifth episode of Luck, and I’m sure we could all pontificate endlessly on, say, the episode’s continued expression of the theme that life is for those who rise up and take the chances they get or Dustin Hoffman’s increasingly incredible performance or the slow dissolution of Joey. But that’s not what I’m thinking about as I look back on this episode. No, where I need to start is that race. Because good God, who wants to get hit with a horseshoe that cuts open a giant gash in their leg and then have to run the rest of the race? The race sequences have been the most viscerally thrilling thing about Luck from the first. In some ways, they’re what’s keeping this show from descending into something like John From Cincinnati, which I kind of like but will admit is only for diehard David Milch cultists. That show tried to turn surfing into its unifying element, the thing that brought everybody together to wonder at the majesty of nature and the ways in which man has devised to conquer it. That show was about man’s relationship to the divine, and the waves were like God: We could only ride them for a little while, but in so doing, we got a brief enough glimpse of the whole picture as to inspire wonder. Luck is much more prosaic and less concerned with the sacred, but in some ways, “luck,” as a concept, is serving the same function God did in that series. When you’re on a lucky streak or clinging to the side of a lucky streak, there’s nothing quite like it, and to get to ride along is a magnificent pleasure, in the same way being perched on the back of a giant thoroughbred and just barely being able to guide it where you want it to go is. Sometimes, though, the horse just takes hold and runs on through, just as sometimes, luck gets you and shakes you by its teeth. Gus’ horse—which is, of course, really Ace’s horse—is making its first run at Santa Anita, in a race that Escalante swears needed his name in there to happen. Ace quickly susses out the truth: Escalante knows that Pint Of Plain is a great horse, and he knows if he puts him in a race just to fill out the ranks, with a scrub jockey on his back, the odds will be long. And in that case, Escalante can once again bet on the horse and collect a healthy jackpot. Ace wants none of this. (Gus seems oddly excited about the horse running. It is his horse, technically.) He wants the horse to scratch. Escalante will only guarantee “90 percent” that the horse scratches. Thus, the two come to a deal: Switch out the jockey, and the horse can run. If I were a betting man, I’d wager that what we’re heading toward here is a season finale showdown between Pint Of Plain, Mon Gateau, and Gettin’ Up Mornin’. (I’d also wager that that race sequence will last several hours, despite the race it’s depicting lasting but three minutes, and that it will be the most marvelous several hours of television you’ll ever see.) But before we can get there, we need all of the players on the board, which means we need to see Pint run. The sequence where he does is, of course, thrilling (all of them are), but what really makes it is that the show figures out a way to make this one just different enough. We got to see how wondrous Mon Gateau was in the first episode, then in the last episode, we saw Gettin’ Up overcome a massive deficit to win a race in thrilling fashion. So we need an equally impressive origin story for Pint Of Plain, and damned if Milch, episode writer Scott Willson, and director Brian Kirk don’t find it. As the horses break down the opening stretch, one of the horses in front of Pint Of Plain loses a shoe. Through wonky CGI, the horseshoe flies backward, slicing Pint in the back leg, causing the horse to seize up and blood to stream. Kirk makes the whole incident seem as hellish and disorienting as possible for horse and jockey (and the people in the stands), and it seems as if Pint’s career will be over before it even begins. Yet there the great horse is, closing in, overtaking the others on the backstretch, to the delight and excitement of Rosie, the gamblers, and everyone else watching. When Ace turns to Claire (who’s accompanied him to the races after he gave her a check above and beyond what she asked for) and tells her how amazing the horse is, it’s hard not to agree, even if we’ve already seen two other horses we’ve been asked to believe in the well-nigh-supernatural capabilities of. In other news, this is the episode that breaks the format we’re used to already. Milch has been known to do episodes that stretch one day over two episodes—like the second season premiere of Deadwood, which split the day and night of one day into two different hours—but I can’t think of another one since his network days that crammed two days into one story. It’s, honestly, a bit jarring to hear the gamblers talk about going to get some dinner, when it really seems like they’d be headed off for breakfast or lunch, and when the conversation between Ace and Gus comes at the episode’s midpoint (again talking about how life is for those who are living), it’s tempting to say the episode feels rushed. That’s a good thing for the episode, ultimately, because everybody here is rushing ahead with things they weren’t quite sure they would dive into quite so quickly. Ace and Claire’s flirtation reaches the level of a pseudo-date. The gamblers now have T-shirts to show off their stable name and affiliation. Escalante and Jo graduate to sleeping quietly together in the stables, where just anybody might see them. And, of course, Pint Of Plain is running, even when all involved thought he would sit out the races just a bit longer. Sometimes, you see something you really want, and you just have to reach out and grab it, even if it throws you from your comfort zone or makes you behave rashly. All of these characters are chasing something—luck, most broadly, but whatever most made them happy at one time, more specifically—and in this episode, they’re starting to see how they might find it. The show also feels sharper, clearer, as we enter this episode, as though we’re getting a much better sense of how all of these people interact and bounce off of each other. In particular, Joey really snaps into focus in this episode, as he spends much of the time calling who sounds like his ex-wife, Lynn. (They have a kid together, whom he calls “the squirt.”) All he gets is her answering machine, and even though he’s on a bit of a lucky streak himself (if you can call “getting paid off to keep the kid you promised a chance off the horse he was going to get that chance on” a lucky streak), it’s meaningless without someone to share it with (another theme of the episode), leaving him to offer up increasingly plaintive laments after the sound of the beep. The guy’s still a garden-variety sad sack, but something in Richard Kind’s performance is hitting that level where a sad sack becomes something much more desperate and capable of anything. 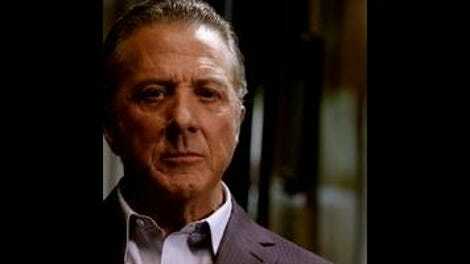 Most of all, though, I love Dustin Hoffman in this episode. I love the way he looks both thrilled and terrified when he hears Claire has come to see him, and he’s still in his pajamas. I love the way he slowly rises as he watches the horse run, sees it overcome intense pain to win the race. I love the look of amusement he holds as Gus talks about how Babe Ruth and George Patton are dead, but the two of them are alive. And I love, love, love that moment at the end, as Devendra Banhart sings and Pint Of Plain nuzzles a sleeping Ace (who’s passed out in a chair by the big animal’s stall), waking him to stand and slowly caress his nose. Kirk’s camera links the two, staring first into Pint’s big, warm, strange eye, then into Ace’s small, cold, equally strange eye. These are two creatures—man and horse—we can’t really know, can’t really understand. They each, in their own way, are alien to us, and all we can do is observe. Here’s your reminder for the week that I wrote these while going through the episodes the first time. The above has no knowledge of what’s coming, while my comments necessarily will. Escalante says Joey “stutters like Porky Pig,” which is about the easiest possible insult to level at a stutterer, but somehow sounds much more devastating with his accent. I love the way the show is fleshing out the world of the track, like how we get to meet Tony, a homeless man who combs through the bathroom’s trash cans for aluminum cans. Minor complaint: I hope Joan Allen gets more to do. To hire an actress of her caliber and give her as little as she’s gotten seems a little pointless to me. Though I did have the very brief fear that she’s trying to rip Ace off, which could be interesting. Another thing I’d bet anything on: Rosie and Leon will be riding against each other in that final race. I’d say Lonnie would be there, too, but he seems out for the foreseeable, and he’s mostly just around to sneer at Joey now. Which is good! We need that!